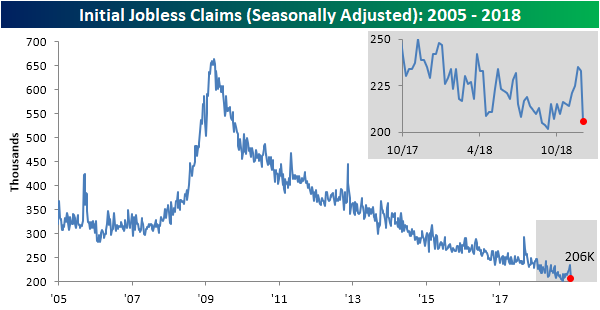 After nearly two months of trending upwards, initial jobless claims fell dramatically this week to 206K versus last week’s 231K on a seasonally adjusted basis. This low reading is only 4K off of the multi-decade low of 202K from mid-September, and at 40 year lows for all but three readings from the last week of August and first two weeks of September. Claims were expected to decline this week, but the actual reading blew the 226K forecast out of the water; this was the largest beat since April. This week’s release has of course held onto a number impressive streaks. They have now spent 62 weeks below 250K, the best streak since January 1970 when the streak ended at 89 weeks. 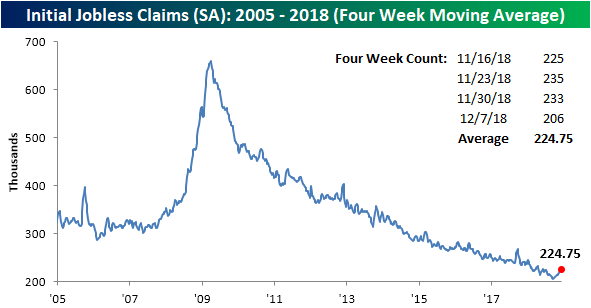 Claims have also held below 300K for a record 197 weeks. Given population and employment trends since the previous records, these current streaks are arguably a lot more impressive. Following the previous several weeks’ elevated levels, this week’s low reading helps to reaffirm the health of these streaks. Taking a look at the four-week moving average, this week’s data point is still unconcernedly elevated but below levels last week. The four-week moving average comes in at 224.75K, down from last week’s 231K. While it is still at very low levels in the grand scheme of things and should be no cause for concern, it has now been 13 weeks since the last time it made a cycle low. On a non-seasonally adjusted basis, initial claims fell off of last week’s highs down to 260.5K. This drop is in line with seasonal patterns that have been previously observed. Important to note, this week of the year typically comes before a major spike in claims and this dip off highs has happened in prior instances (can be seen in the past two years in the chart below). In other words, while this week was remarkably strong, it could come in part from seasonal factors and in upcoming releases, especially on a non-seasonally adjusted basis, there could be a higher reading due to seasonal effects. Regardless, today’s data maintains a healthy labor market and came in well below the average for the current week in the past 18 years of 439.7K and since 2005 there has not been a better week for initial jobless claims.